I’m a little sceptical that this web-page ‘energy saver’ I just saw is actually a power-saver?! Original ‘screen savers’ on a computer were a response to problems with the then-prevalent screen technology associated with Cathode Ray Tube (CRT) screens that had phospors that glowed when hit by a focused electron beam. If phosphor pixels were lit up too much they could be ‘burnt’ which could leave a ghost image if a particular pattern was left on the screen for extended periods of time. A standard response was to ‘save’ the screen; generally by darkening it, and often by moving a shape around; this was saving the phosphor rather than saving energy! (I would speculate that some energy would have been saved but miniscule amounts — the cathode-ray still had to be scanned as much as it ever did; a CRT would probably still consume hundreds of watts of power while in this ‘screen saving’ mode). The energy saving part of screen-savers came later; in this mode the monitor was generally actually turned off; and thus this saved the main power consumption of the screen – potentially saving hundreds of watts as long as the screen was off… and I guess it must have been in the 1990’s that ‘Energy Star’ and powering-off screens when not in use became pretty-standard. Modern screens, however, with LCD / TFT type technologies generally have different features and problems than CRTs; and screen ‘burn’ is less of an issue as I understand it, so ‘screen savers’ intended to prevent burn-in are pretty irrelevant… and often because screen manufacturers are doing their best to reduce power where possible. My screens will attempt to detect my presence and will automatically reduce power if I am not close to the screen! Note; this is the monitor going into power-save mode and whether or not Windows happens to choose to run a screen-saver or whatever is not necessarily relevant in this instance. Whichever way, it is hard to imagine that one tab on one application on your computer going dark is likely to help reduce your power consumption at all; especially as any modern device worth its salt will already be applying its own layer of power reduction technology of its own! 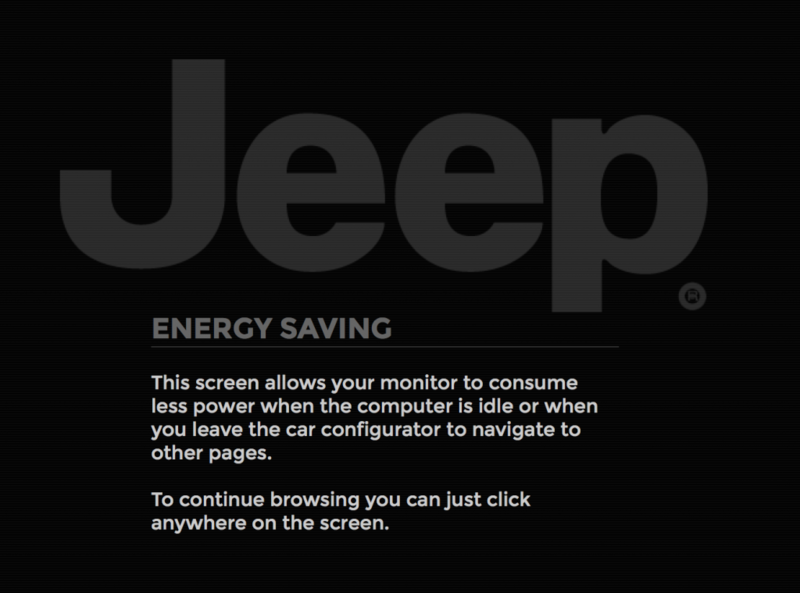 And as it is a car company who’ve come up with this great idea, I can imagine someone is busy trying to offset the car company’s ‘carbon footprint’ against all the ‘carbon savings’ they will claim from their ‘black website page carbon save technology’! In what circumstances could an ‘energy saving webpage’ save energy?